A mountaintop spa resort in the Arkansas Ozarks overlooking the Victorian village of Eureka Springs and a proud member of Historic Hotels of America. The hotel is located 45 minutes southwest of Branson, Missouri and offers 15 acres of formal gardens and pristine woodlands criss-crossed with hiking trails. Ammenities include the New Moon Spa & Aveda Salon, 1886 Steakhouse, Sky Bar Gourmet Pizza. The Crescent is a top destination wedding site as well as "America's Most Haunted Hotel" with nightly ghost tours. 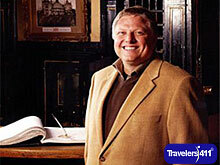 Jack Moyer, General Manager was on the October 27, 2013 "Travel with Stephanie Abrams!" Radio Show in hour 1.